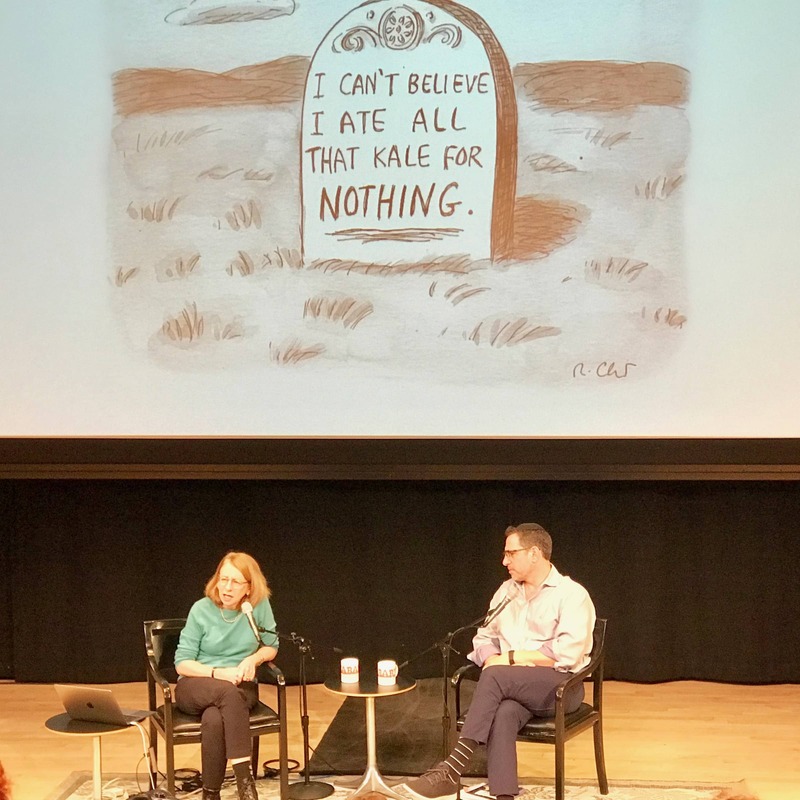 Reimagine End of Life New York, the week-long series of events exploring big questions of life and death, is in the books. In bringing the series to New York from San Francisco, organizers hoped for 75 or so successful events. 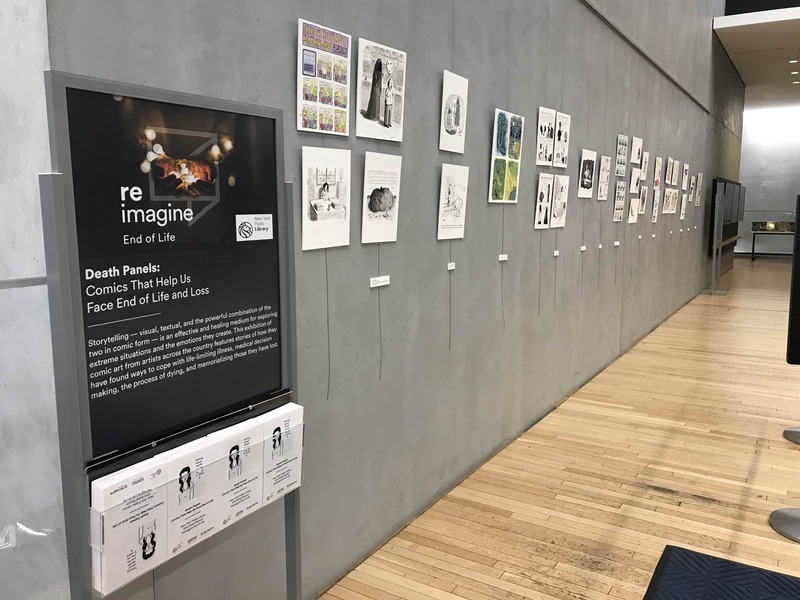 There were over 350, and Graphic Medicine was the focus of a few. 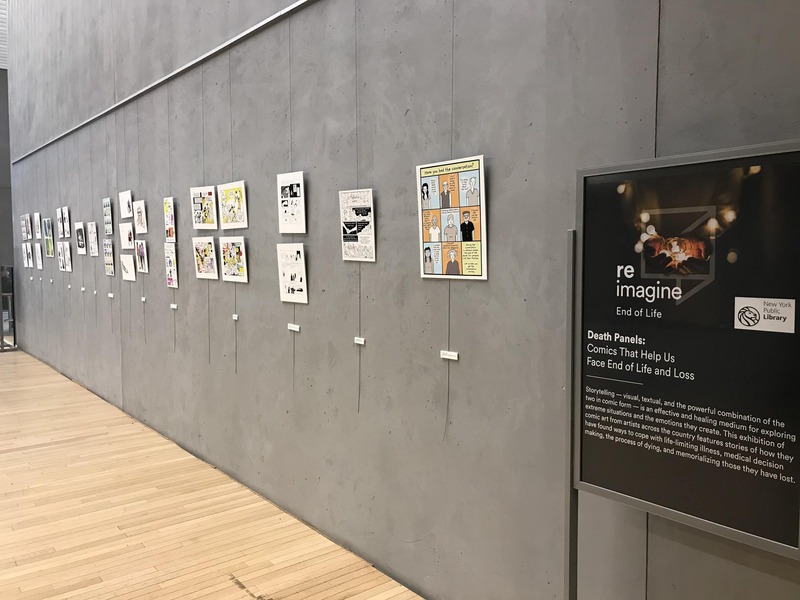 Running the entire week was an exhibit of comic art at the 53rd Street New York Public Library, which had two components. 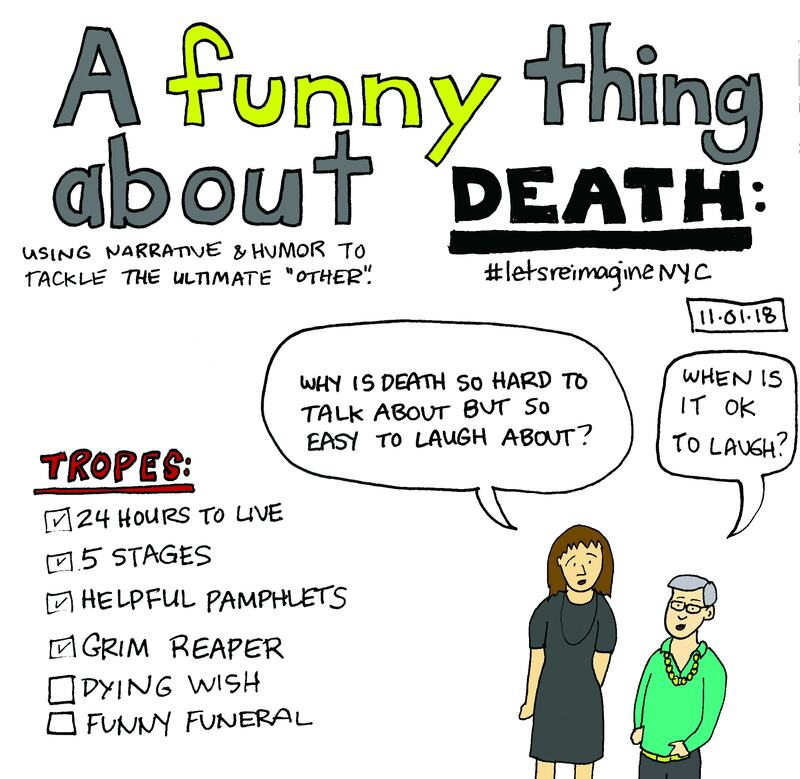 Upstairs at the branch was “Death Panels: Comics That Help Us Face End of Life.” The exhibit featured art from Roz Chast, Ben Schwartz, Thi Bui, Emily Flake, Kriota Willberg, Isabella Bannerman, Monica Lalanda, Wendy MacNaughton, Pat Arnow, Brian Fies, Sarah Leavitt, and Whit Taylor. 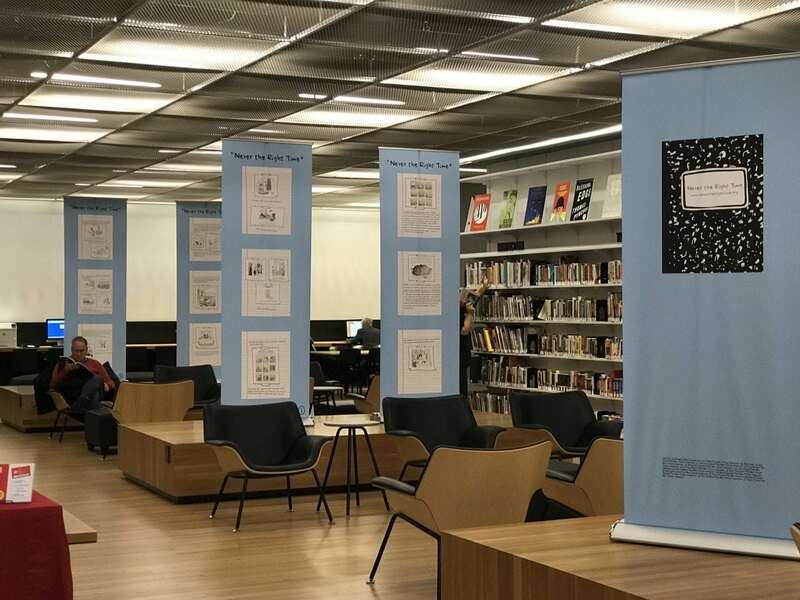 On the lower, main, level of the library was a banner exhibit created by Lois Perelson-Gross called “Never the Right Time” which arises from her community-based efforts to use comics to start conversations about end of life care wishes. 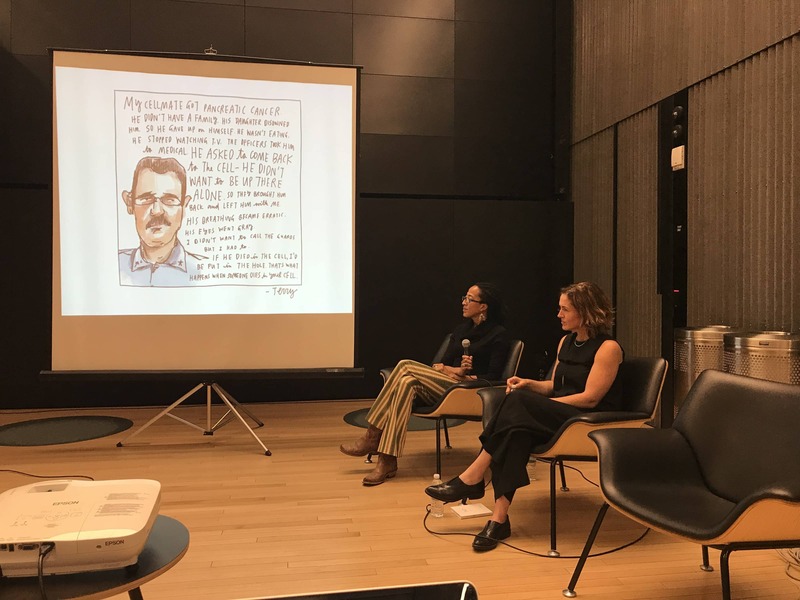 On Monday, Roz Chast was in conversation at the JCC with Rabbi David Ingber of Romemu synagogue. She shared the background story to her 2014 memoir, Can’t We Talk About Something More Pleasant. 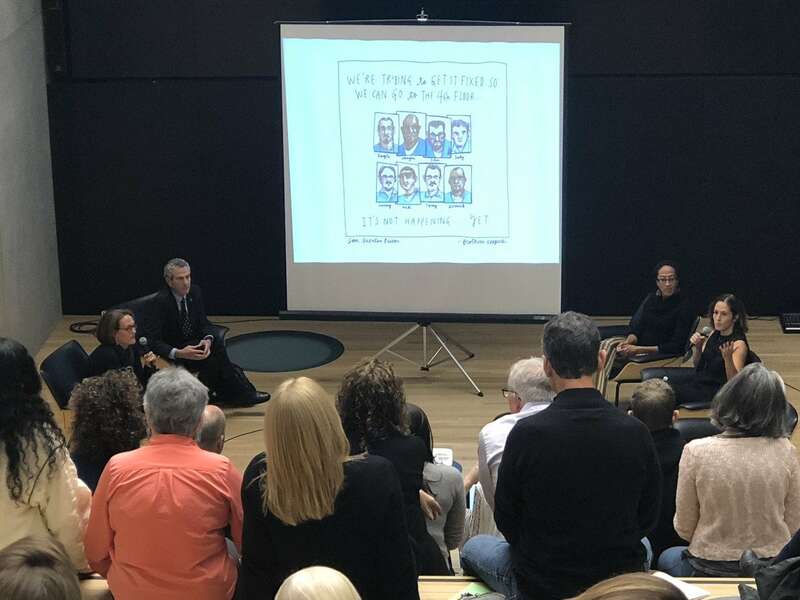 As always, Roz had the crowd between laughter and tears most of the night. The JCC often posts podcasts of their talks here, so keep an eye out. 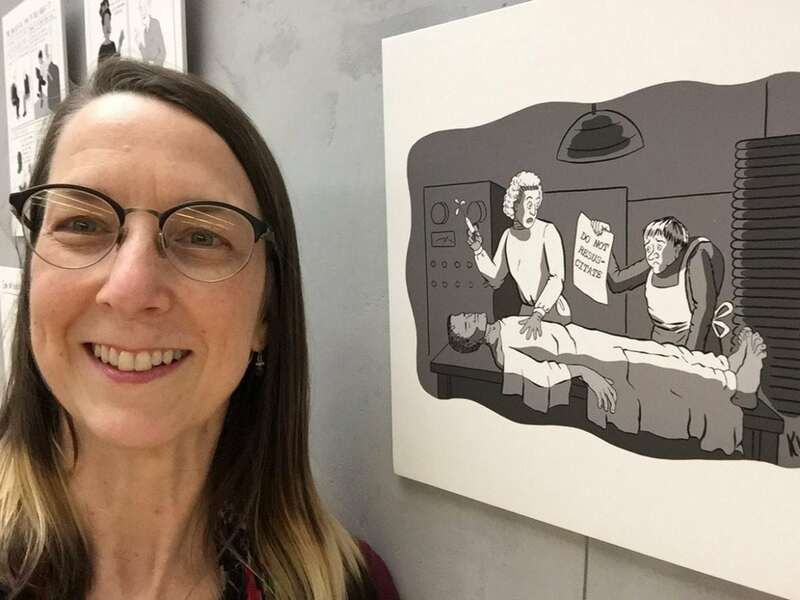 The opening reception for the Death Panels exhibit at the 53rd Street Library took place Tuesday evening. The reception was immediately followed by a panel discussion called “Redemption: An Exploration of Possibilities at the End of Life” featuring hospice artist-in-residence and graphic journalist Wendy MacNaughton, the co-founder of the Humane Prison Hospice Project and hospice nurse Ladybird Morgan, and hospice physician Ira Byock. 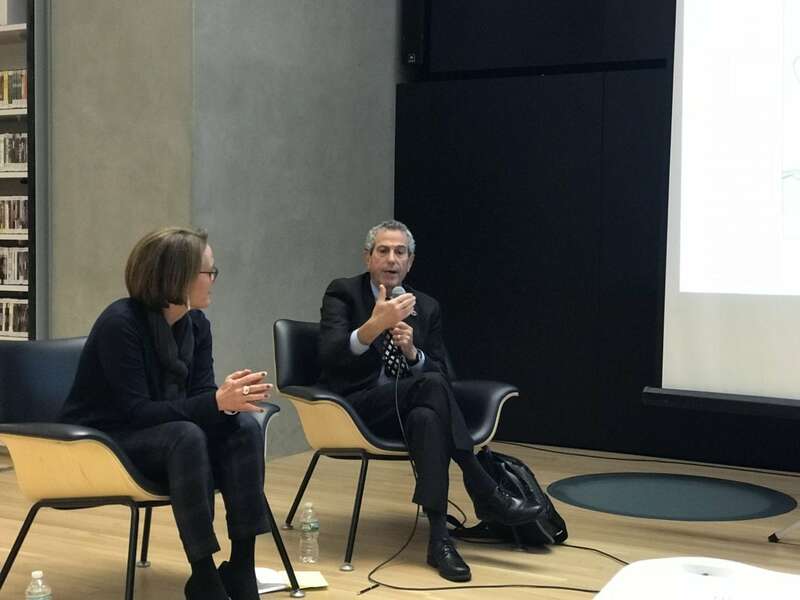 The panel was expertly moderated by Jennifer Brokaw. photo courtesy of Jennifer Brokaw via Twitter. Wednesday afternoon two more events were hosted at the library. First up was a conversation with artists from the exhibit. Marsha Hurst of Columbia’s Narrative Medicine program moderated a panel discussion with Isabella Bannerman (Palliative Care comic, an interview with her sister, a palliative care physician), Pat Arnow (Posey’s Plan: A Memoir of My Neighbor’s Timely Death) and New Yorker cartoonists Emily Flake and Ben Schwartz. More on this panel later as it was recorded and if all agree, it will be an upcoming graphic medicine podcast. 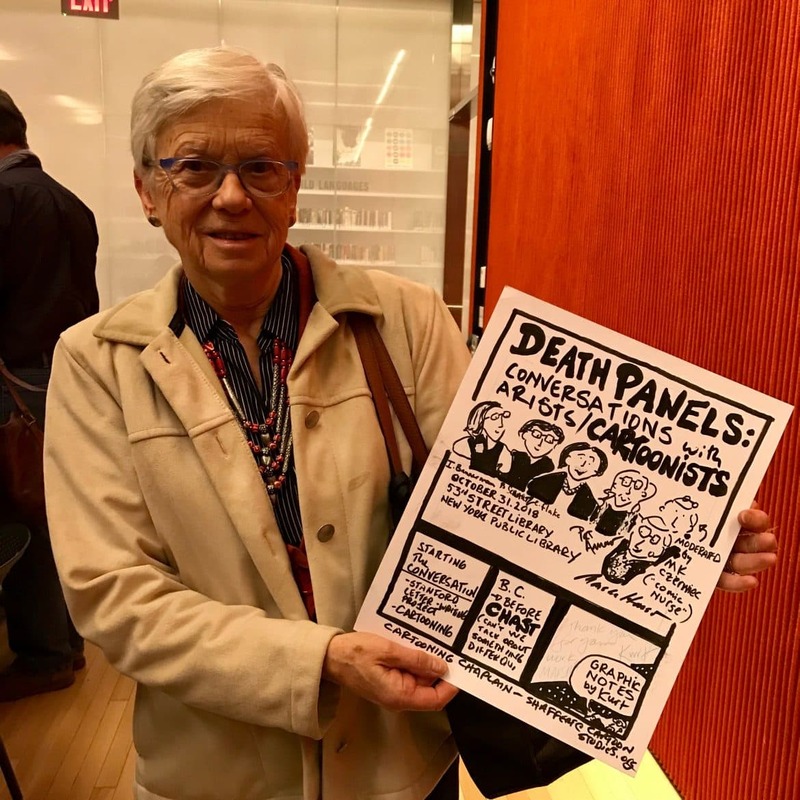 Marsha Hurst displays Kurt Shaffert’s drawing of her panel discussion. More photos from the panel to come. 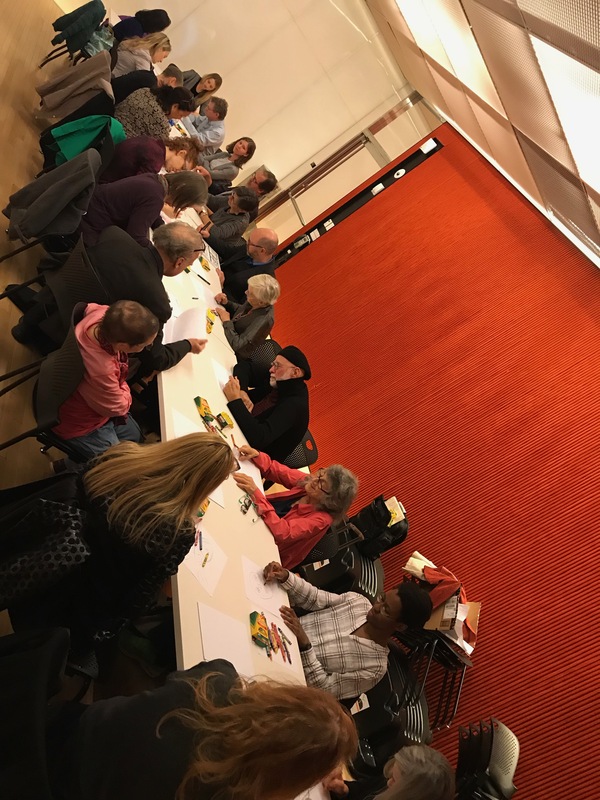 After the panel discussion I (MK) conducted a workshop called, “Graphic Medicine, Reflective Drawing, and Advance Care Directives.” Participants were engaged and feedback was good. 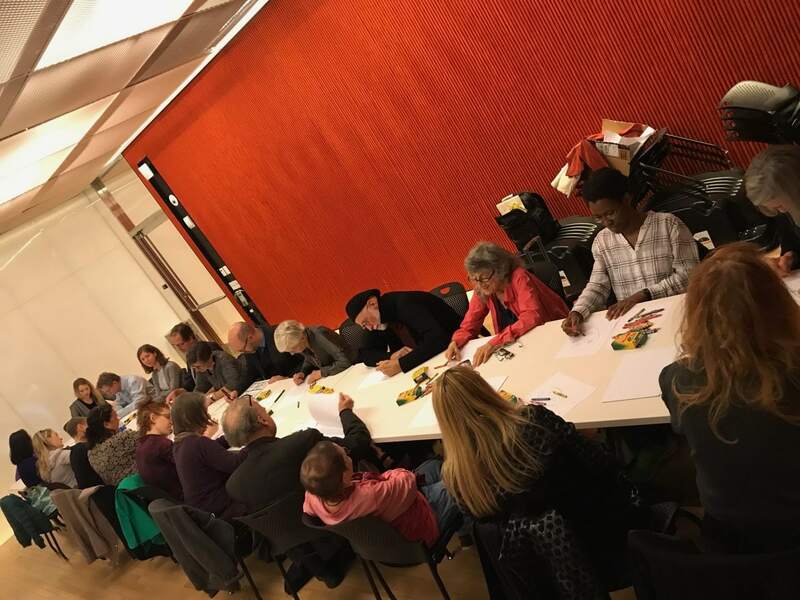 Participants drawing in my graphic medicine workshop, 53rd Street library. 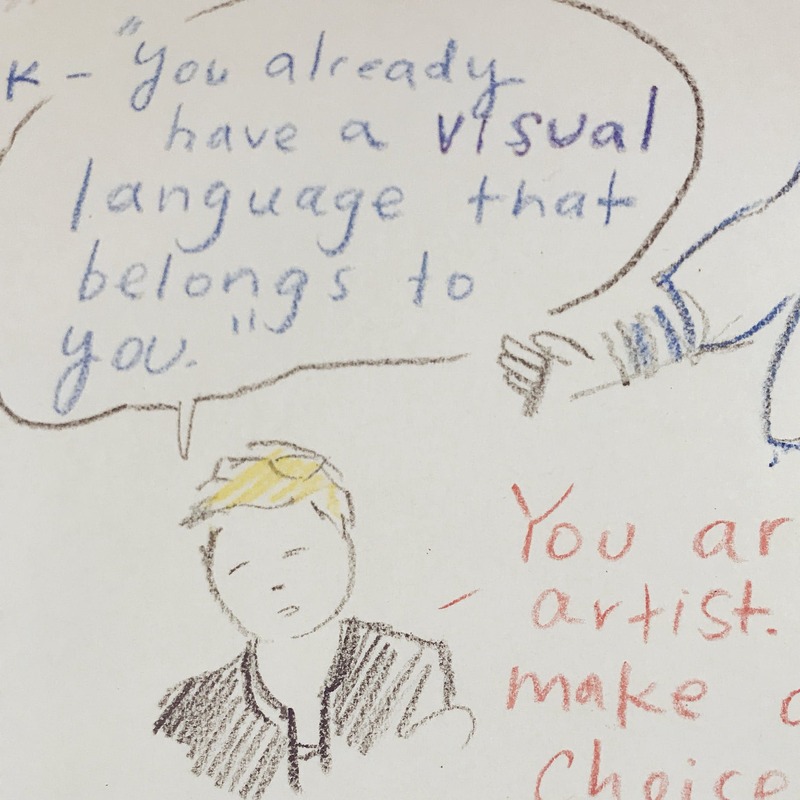 Grace Farris sketch note from my workshop, via Twitter. 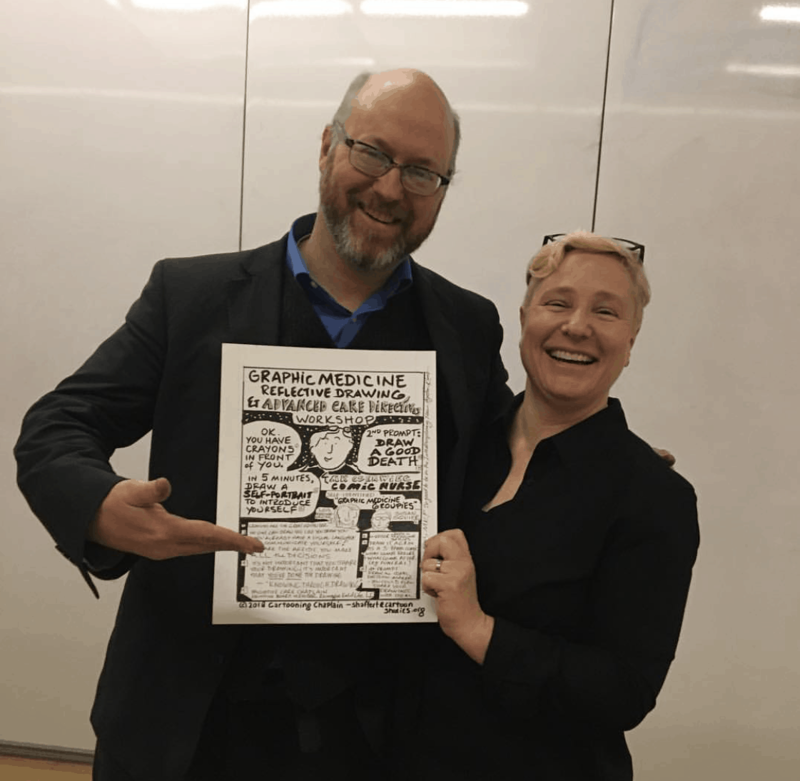 Kurt Shaffert and me with his sketch notes of my workshop. On Thursday, Marsha Hurst and her colleague Cherie Henderson conducted a Columbia University Seminar on Narrative, Health, and Social Justice, “A Funny Think About Death: Using Humor and Narrative to Tackle a Taboo.” Their presentation employed video, audio, and single panel comics to look at what we find funny about death, as well as tropes and conventions of humor around death. My sketch notes from Marsha & Cherie’s workshop. Friday PM I was on a panel of Reimagineers looking at dying, death, and grief from unique perspectives for a live recording of the Death by Design podcast hosted by Kimberly Paul. Will post that link when the episode is available. 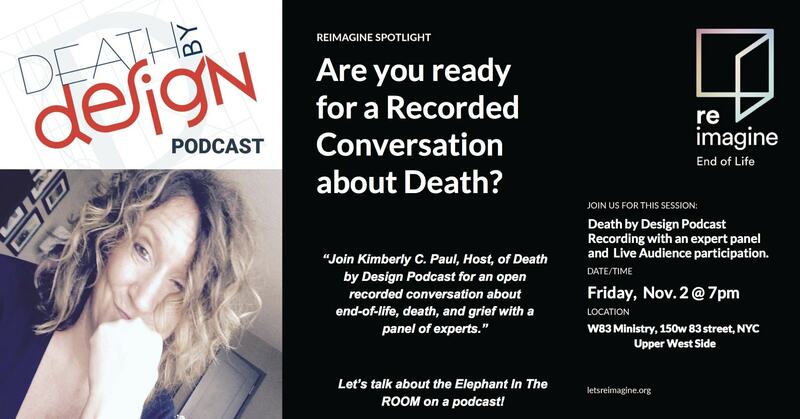 Panel during recording of the Death by Design podcast, photo courtesy of Kimberly Paul. As should be apparent, this was an amazing week. And these are only the Graphic Medicine-related events! 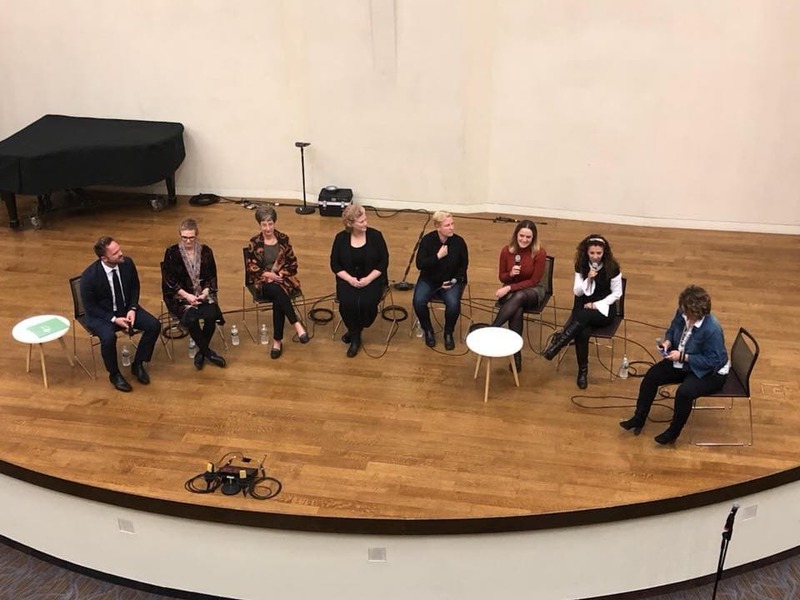 There were also opening gala ceremonies, wonderful dinners and drinks with colleagues and new friends, theater, dance, meeting people who I hope will become colleagues, so much more. Thank you to all the artists, organizers, funders, and collaborators that made this amazing week possible.